The glow-worm caves at Waitomo have been widely publicised as one of the most spectacular tourist attractions in the central North Island. 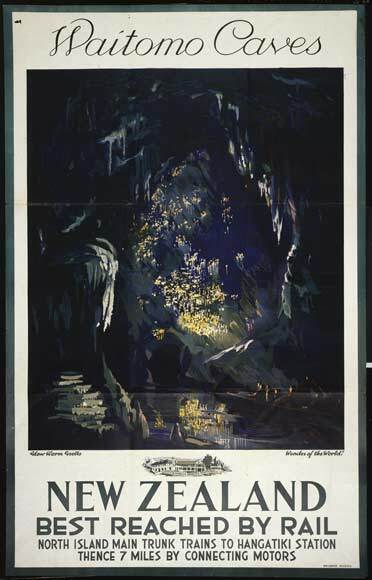 In the 1930s the New Zealand Railways Department published this poster of the glow-worm grotto at Waitomo Caves, to promote rail travel as the best way of getting to the caves region. I have been to the Waitomo glow worm caves numerous times now and I never cease to be amazed by the beauty of these caves. Definately a place to go if you are visiting NZ!